February 3, 2019: COMMEMORATION OF ST. BLASÉ, BISHOP AND MARTYR. O God, who, by the yearly solemnity of blessed Blasé, thy Martyr and Bishop, rejoicest the hearts of thy faithful; mercifully grant that we, who celebrate his martyrdom, may enjoy his protection. Through our Lord Jesus Christ, thy Son, who liveth and reigneth with thee, in the unity of the Holy Ghost, God, world without end. Amen. Now that the Church, has closed the joyous period of her Forty Days of Christmas, and is putting us through a course of meditations on subjects which are to excite a spirit of penance within us,—each of the Saints’ Feasts must produce an impression, which shall be in accordance with that spirit. From this day till Easter, we will study the Saints, as they come to us, in this special light,—how much they laboured and suffered during their pilgrimage of life, and what was the plan they took for conquering the world and the flesh. They went, says the Psalmist, and wept, casting their seeds: but coming they shall come with joyfidness, carrying their sheaves (Ps, cxxv. 6, 7). It shall be the same with us; and, at the end of our Lenten labours, our Risen Jesus shall hail us as his living, regenerated, Children. The Calendar of this portion of the year abounds with Martyrs; and, at the very onset, we meet with one of the most celebrated of these glorious champions of Christ. The scene of his pastoral virtues and his martyrdom, was Sebaste, a city of Armenia, the same that will give us forty martyred soldiers on a single day. The devotion to St. Blase is, even to this day, most fervently kept up in the East... The Western Churches soon began to love and honour his memory, and so universally, that we might call him one of the most popular of our Saints. […] The Church of Rome has given a mere Lesson on his Life. Blase, whose signal virtues made him dear to the people of Sebaste in Armenia, was chosen Bishop of that City. When the Emperor Dioclesian waged his cruel persecution against the Christians, the Saint hid himself in a cave on mount Argeus, and there he remained sometime concealed, but was at length discovered by some soldiers of the governor Agricolaus, whilst they were hunting. They led him to the governor, who gave orders that he should be put into prison. During his imprisonment, many sick people, attracted by the reputation of his sanctity, came to him, and he healed them. Among these was a boy, whose life was despaired of by the physicians, on account of his having swallowed a bone, which could not be extracted from his throat. The Saint was twice brought before the governor, but neither fair promises nor threats could induce him to offer sacrifice to the gods. Whereupon, he was first beaten with rods, and then his flesh was torn with iron hooks whilst he lay stretched on the rack. At length, he was beheaded, and nobly gave testimony to the faith of Christ our Lord, on the third of the Nones of February (February 3rd). Pray, O holy Pontiff, for the country thou didst water with thy blood. Armenia lost the faith for which thou didst lay down thy life. Intercede for her, that she may be restored to the Church, and let her conversion bring consolation to the few that have remained orthodox and faithful. 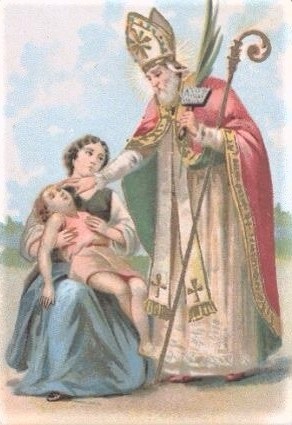 St. Blasé, pray for us.